This bicycle front seat allows you to keep an eye on your child and the road at the same time. The sturdy aluminum alloy tube can bear a capacity of 25kg. It is easy to install and uninstall the seatpost of your bike, suitable for most mountain bicycles, road bikes, and electric bikes. Easy to assemble and detachable. 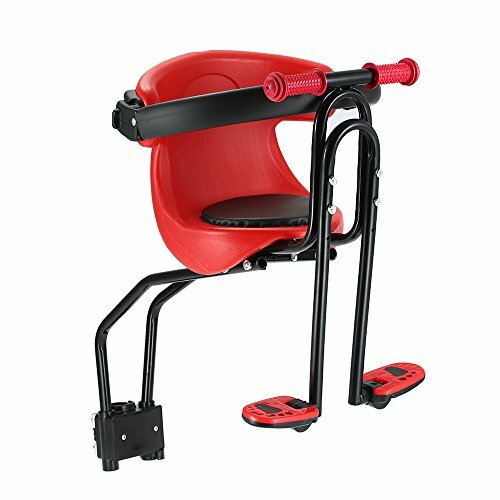 Padded seat provides superior comfort. The pedals offer a safety rest for your children's feet. Sturdy aluminum alloy tube can bear a maximum weight of 25kg (55lbs). Clamp fits for almost any seat post, suitable for mountain bikes, road bikes and electric bikes.